जो तुमसे बात पर निर्भर करता है, you’re going to hear a number of answers to this question. संक्षिप्त जवाब हाँ है, टैटू चोट, कुछ हद तक. टैटू दर्द का अनुभव व्यापक रूप से भिन्न होता है, टैटू की नियुक्ति पर निर्भर करता है, आकार, tattooer का कौशल, और ग्राहक की व्यक्तिगत सहिष्णुता. Many tattoos are more irritating than painful, especially during the healing stage, when they tend to get very itchy. You certainly shouldn’t let fear of pain dissuade you from getting a tattoo, although you may want to think about placement if pain is a big concern for you. 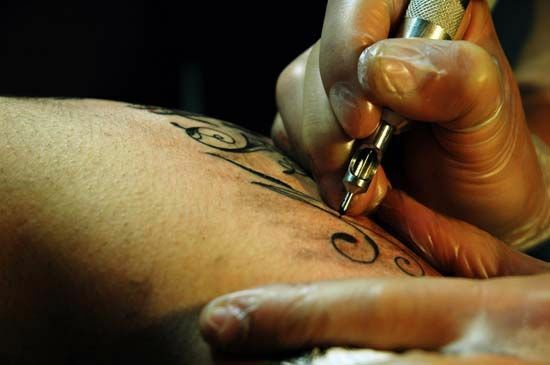 Some companies sell numbing cream for tattoos, a practice which has met with mixed response from the tattoo community. Some artists think that since tattoos hurt, it is not unreasonable to numb the skin beforehand. Others are concerned that these compounds may compromise the integrity of the inks used, or they may increase the risk of infection. More importantly, numbing creams take a while to work and they wear off quickly, so they may not be as effective as the body’s natural tools for fighting pain. It is important to remember that everyone’s response to pain is slightly different. You can decrease the potential of a painful tattoo by talking to your tattoo artist about your concerns and eating a healthy meal beforehand to settle your stomach. Stay hydrated as well, as this will promote rapid healing of the site. You should never be ashamed to ask for a break in the tattooing, and you should alert your artist if you feel faint or uncomfortable. Tattoo artists are well aware that tattoos hurt and that different people handle the pain differently, and they will not criticize you for asking for a break.